Gabon ( /ɡəˈbɒn/ ; French pronunciation: ​ [ɡabɔ̃] ), officially the Gabonese Republic (French : République gabonaise), is a country on the west coast of Central Africa. 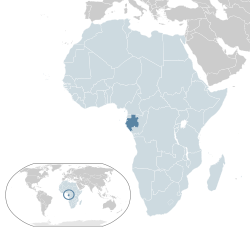 Located on the equator, Gabon is bordered by Equatorial Guinea to the northwest, Cameroon to the north, the Republic of the Congo on the east and south, and the Gulf of Guinea to the west. It has an area of nearly 270,000 square kilometres (100,000 sq mi) and its population is estimated at 2 million people. 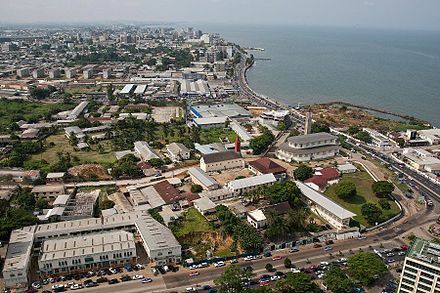 Its capital and largest city is Libreville. Central Africa is the core region of the African continent which includes Burundi, the Central African Republic, Chad, the Democratic Republic of the Congo, and Rwanda. Middle Africa is an analogous term that includes Angola, Cameroon, the Central African Republic, Chad, the Democratic Republic of the Congo, Equatorial Guinea, Gabon, the Republic of the Congo, and São Tomé and Príncipe. All of the states in the UN subregion of Middle Africa, plus those otherwise commonly reckoned in Central Africa, constitute the Economic Community of Central African States (ECCAS). Since its independence in 2011, South Sudan has also been commonly included in the region. An equator of a rotating spheroid is its zeroth circle of latitude (parallel). It is the imaginary line on the spheroid, equidistant from its poles, dividing it into northern and southern hemispheres. In other words, it is the intersection of the spheroid with the plane perpendicular to its axis of rotation and midway between its geographical poles. Abundant petroleum and foreign private investment have helped make Gabon one of the most prosperous countries in Sub-Saharan Africa, with the 7th highest HDI  and the fourth highest GDP per capita (PPP) (after Mauritius, Equatorial Guinea and Seychelles) in the region. GDP grew by more than 6% per year from 2010 to 2012. However, because of inequality in income distribution, a significant proportion of the population remains poor. Sub-Saharan Africa is, geographically, the area of the continent of Africa that lies south of the Sahara. According to the United Nations, it consists of all African countries that are fully or partially located south of the Sahara. It contrasts with North Africa, whose territories are part of the League of Arab states within the Arab world. The states of Somalia, Djibouti, Comoros and the Arabic speaking Mauritania are however geographically in sub-Saharan Africa, although they are members of the Arab League as well. The UN Development Program lists 46 of Africa’s 54 countries as “sub-Saharan,” excluding Algeria, Djibouti, Egypt, Libya, Morocco, Somalia, Sudan and Tunisia. Mauritius, officially the Republic of Mauritius, is an island nation in the Indian Ocean. The main Island of Mauritius is located about 2,000 kilometres (1,200 mi) off the southeast coast of the African continent. The Republic of Mauritius also includes the islands of Rodrigues, Agalega and St. Brandon. The capital and largest city Port Louis is located on the main island of Mauritius. The Komo is a river of Equatorial Guinea and Gabon. It flows for 230 kilometres (140 mi). Bantu people are the speakers of Bantu languages, comprising several hundred indigenous ethnic groups in sub-Saharan Africa, spread over a vast area from Central Africa across the African Great Lakes to Southern Africa. Linguistically, Bantu languages belong to the Southern Bantoid branch of Benue–Congo, one of the language families grouped within the Niger–Congo phylum. The Bantu expansion is a major series of migrations of the original proto-Bantu language speaking group, who spread from an original nucleus around West Africa-Central Africa across much of sub-Saharan Africa. In the process, the Proto-Bantu-speaking settlers displaced or absorbed pre-existing hunter-gatherer and pastoralist groups that they encountered. 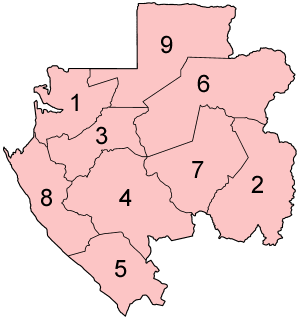 Myene is a cluster of closely related Bantu varieties spoken in Gabon by about 46,000 people. It is perhaps the most divergent of the Narrow Bantu languages, though Nurse & Philippson (2003) place it in with the Tsogo languages (B.30). The more distinctive varieties are Mpongwe (Pongoué), Galwa (Galloa), and Nkomi. 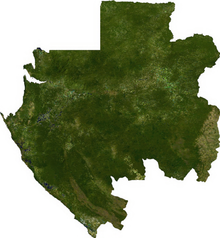 In 1910, Gabon became one of the four territories of French Equatorial Africa,  a federation that survived until 1959. 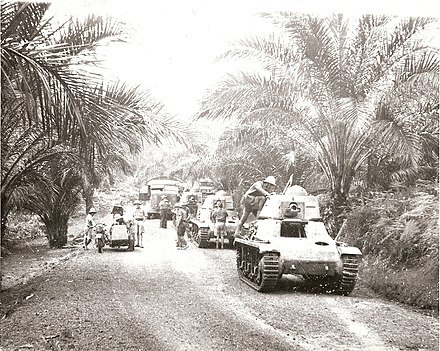 In World War II, the Allies invaded Gabon in order to overthrow the pro-Vichy France colonial administration. The territories of French Equatorial Africa became independent on August 17, 1960. The first president of Gabon, elected in 1961, was Léon M'ba, with Omar Bongo Ondimba as his vice president. In provisional results,[ when? ] the ruling Gabonese Democratic Party (PDG) won 84 out of 120 parliamentary seats. Geologically, Gabon is primarily ancient Archean and Paleoproterozoic igneous and metamorphic basement rock, belonging to the stable continental crust of the Congo Craton, a remnant section of extremely old continental crust. Some formations are more than two billion years old. Ancient rock units are overlain by marine carbonate, lacustrine and continental sedimentary rocks as well as unconsolidated sediments and soils that formed in the last 2.5 million years of the Quaternary. The rifting apart of the supercontinent Pangaea created rift basins that filled with sediments and formed the hydrocarbons which are now a keystone of the Gabonese economy. Gabon is notable for the Oklo reactor zones, the only known natural nuclear fission reactor on Earth which was active two billion years ago. The site was discovered during uranium mining in the 1970s to supply the French nuclear power industry. Most of the health services of Gabon are public, but there are some private institutions, of which the best known is the hospital established in 1913 in Lambaréné by Albert Schweitzer. Gabon's medical infrastructure is considered one of the best in West Africa [ by whom? ]. By 1985 there were 28 hospitals, 87 medical centers, and 312 infirmaries and dispensaries. As of 2004 [update] , there were an estimated 29 physicians per 100,000 people. Approximately 90% of the population had access to health care services. Imported rock and hip hop from the US and UK are popular in Gabon, as are rumba, makossa and soukous. Gabonese folk instruments include the obala, the ngombi [ fr ], the balafon and traditional drums. The Gabon national football team has represented the nation since 1962. The Under-23 football team won the 2011 CAF U-23 Championship and qualified for the 2012 London Olympics. Gabon were joint hosts, along with Equatorial Guinea, of the 2012 Africa Cup of Nations,  and the sole hosts of the competition's 2017 tournament. Arsenal striker Pierre-Emerick Aubameyang plays for Gabon national team. The Gabon national basketball team, nicknamed Les Panthères,  finished 8th at the AfroBasket 2015, its best performance ever. Little is known of the history of Gabon prior to European contact. Bantu migrants settled the area beginning in the 14th century. 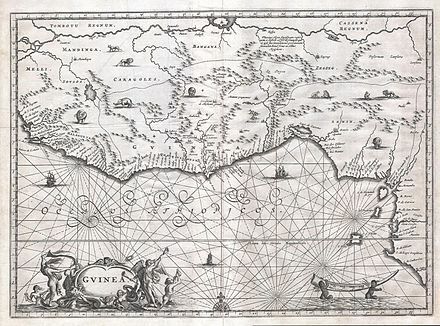 Portuguese explorers and traders arrived in the area in the late 15th century. The coast subsequently became a center of the slave trade with Dutch, English, and French traders arriving in the 16th century. In 1839 and 1841, France established a protectorate over the coast. 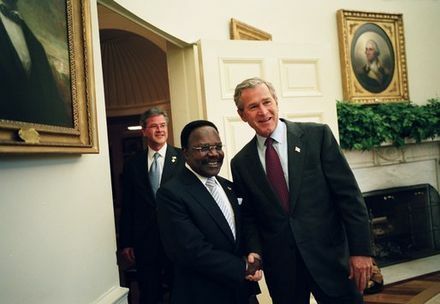 Paulin Obame-Nguema is a Gabonese politician who was the Prime Minister of Gabon from 2 November 1994 to 23 January 1999. He is currently a Deputy in the National Assembly of Gabon. Zacharie Myboto is a Gabonese politician and President of the National Union (UN), an opposition party. He was the Administrative Secretary of the Gabonese Democratic Party (PDG) from 1972 to 1990 and served in the government from 1978 to 2001. After resigning from the government, he became an opposition leader, founding the Gabonese Union for Democracy and Development (UGDD) in 2005 and placing third in the 2005 presidential election. He became President of the Group of the Forces of Change in the National Assembly in 2007. Faustin Boukoubi is a Gabonese politician who has been the Secretary-General of the Gabonese Democratic Party (PDG) since 2008. He previously served in the government of Gabon as Minister of Public Health from 1997 to 2004 and as Minister of Agriculture from 2004 to 2008. 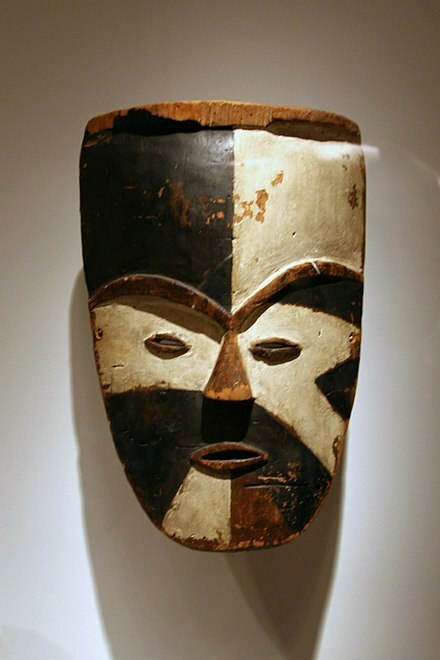 The African nation of Gabon has had human inhabitants for perhaps 400,000 years. Bantu peoples settled here from the 11th century. The coastline first became known to Europeans through Portuguese and Dutch sailors. Colonised by the French in the 19th century, Gabon became independent in 1960. 1 2 3 "World Population Prospects: The 2017 Revision". ESA.UN.org (custom data acquired via website). United Nations Department of Economic and Social Affairs, Population Division. Retrieved September 10, 2017. 1 2 3 4 "Report for Selected Countries and Subjects". IMF.org. International Monetary Fund . Retrieved January 20, 2019. ↑ "GINI index (World Bank estimate)". data.worldbank.org. World Bank. Archived from the original on January 21, 2019. Retrieved January 20, 2019. 1 2 3 "2018 Human Development Report". United Nations Development Programme. 2018. Archived from the original on September 14, 2018. Retrieved September 14, 2018. ↑ "Gabon country profile". BBC News. September 24, 2018. Archived from the original on September 25, 2018. Retrieved September 24, 2018. 1 2 3 4 5 6 7 8 9 10 11 12 13 14 15 16 17 18 19 20 21 22 23 24 25 26 27 28 29 30 31 Background note: Gabon Archived June 23, 2017, at the Wayback Machine . U.S. Department of State (August 4, 2010). This article incorporates text from this source, which is in the public domain. 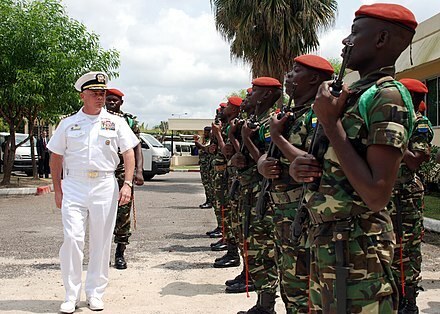 ↑ "Soldiers in Gabon try to seize power in failed coup attempt". Bnonews.com. January 7, 2019. Archived from the original on January 7, 2019. Retrieved January 7, 2019. ↑ "'Between 50 and 100 killed' in Gabon election violence, presidential challenger tells FRANCE 24 - France 24". France 24. September 6, 2016. Archived from the original on August 9, 2018. Retrieved August 9, 2018. ↑ "Motion for a resolution on Gabon, repression of the opposition - B8-0526/2017". Europarl.europa.eu. Archived from the original on August 9, 2018. Retrieved August 9, 2018. ↑ "Global Forest Resources Assessement 2015 website". FAO. Archived from the original on December 10, 2018. Retrieved December 9, 2018. ↑ Schluter, Thomas (2006). Geological Atlas of Africa. Springer. p. 110–112. ↑ "Expedition website". Web.archive.org. Archived from the original on April 20, 2009. Retrieved May 30, 2008. ↑ "The World Factbook". Cia.gov. Archived from the original on March 15, 2016. Retrieved March 16, 2016. 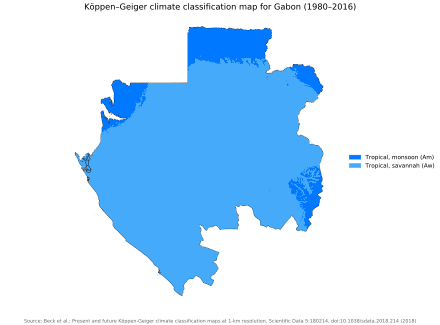 1 2 "Gabon: Provinces, Cities & Urban Places - Population Statistics in Maps and Charts". Citypopulation.de. Archived from the original on July 24, 2018. Retrieved January 7, 2019. ↑ Conrad Ouellon. "Le Gabon". Laval University. Archived from the original on May 29, 2010. Retrieved June 27, 2010. ↑ Duval Smith, Alex (October 9, 2012). "Frosty relations with Hollande see Gabon break the French connection". The Independent. Archived from the original on October 15, 2012. Retrieved October 16, 2012. ↑ "Gabon to introduce English as second official language". Xinhua. October 3, 2012. Archived from the original on November 16, 2013. Retrieved November 17, 2012. 1 2 3 International Religious Freedom Report 2007: Gabon Archived January 19, 2012, at the Wayback Machine . United States Bureau of Democracy, Human Rights and Labor (September 14, 2007). This article incorporates text from this source, which is in the public domain. ↑ "COUNTRY COMPARISON :: HIV/AIDS – ADULT PREVALENCE RATE". CIA World Factbook. Archived from the original on March 7, 2012. Retrieved April 2, 2012. ↑ "COUNTRY COMPARISON :: HIV/AIDS – PEOPLE LIVING WITH HIV/AIDS". CIA World Factbook. Archived from the original on May 21, 2012. Retrieved April 2, 2012. ↑ "COUNTRY COMPARISON :: HIV/AIDS – DEATHS". CIA World Factbook. Archived from the original on May 21, 2012. Retrieved April 2, 2012. ↑ "Gabon". CIA World Factbook. Archived from the original on December 10, 2008. Retrieved November 1, 2009. ↑ "Gabon". 2005 Findings on the Worst Forms of Child Labor Archived December 1, 2006, at the Wayback Machine . Bureau of International Labor Affairs, U.S. Department of Labor (2006). This article incorporates text from this source, which is in the public domain. ↑ "Gabon: Gabon Fédération Gabonaise de Football". Fifa.com. FIFA. Archived from the original on December 10, 2017. Retrieved January 25, 2017. ↑ "Gabon will host the 2012 Africa Cup of Nations final". BBC Sport. BBC. January 29, 2010. Retrieved January 25, 2017. ↑ "Gabon named hosts of AFCON 201". Cafonline.com. CAF. April 8, 2015. Archived from the original on February 9, 2017. Retrieved January 25, 2017. "Gabon". The World Factbook . Central Intelligence Agency.